A look into the women's hockey team at the U.
Lina: My name is Lina von Hartsfeld. I’m the president and general manager of the team. Jackie: My name is Jackie (Jacs) Vars I grew up in Maryland and Montana before finishing high school here in Utah. I graduated with a BA from the University of Utah in 2010. I am a coach for Women's Ice Hockey at the U.
Gavin: How did each of you first take an interest in sports and what were your favorites? Jackie: When I was young, my brother and I played a lot of roller hockey in the driveway. My cousin, Stephanee Grosscup, helped teach me to skate and gave me a love for the ice when visiting her perform in Sun Valley, Idaho. My grandfather, Marve Eyre, also played hockey for the Salt Lake County Sheriff's office in the '70s. I have been a lifelong fan of Maryland/DC teams including the Baltimore Orioles, the Washington Redskins, and of course the Washington Capitals. I also love rugby, and spent some time as a lock for the Salt City Slugs. Lina: My mom always made sure I was involved in sports, or, at least, some physical activity, whether it be soccer or ballet or cheerleading or baseball. I always loved gymnastics because of the challenge. Gavin: What was it about hockey that appeals to each of you the most? Lina: The first game I ever went to, when I was 17. Jackie, my coach, she actually played in that game, I think. She got knocked out with an elbow to the head, and there were loads of fights the whole time. The violence and brutality of it all really got my attention from the start. From there, I grew to genuinely appreciate the game as opposed to just the fights, and then I started playing and absolutely fell in love. Everything about it is great. Jackie: The pace. It is a fun and exciting sport that is very engrossing. Hockey is a great stress reliever and escape from the adult world of responsibility. Just talking about it is really making me want to play. Gavin: Prior to this team, what was each of your experiences in the sport? Jackie: I've played ice hockey for about 12 years. Along with team coaching, I also have experience in being a goalie coach. Lina: I’ve played with the Salt Lake Black Diamonds and the Park City Predators–both amazing teams with amazing women who have made major impacts on my life. They really cemented for me how much I truly love hockey and want to make it a part of my life pretty much until I die. 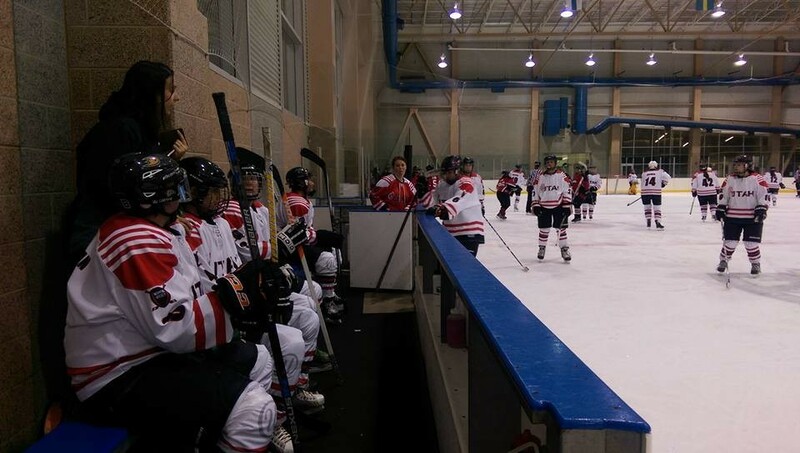 Gavin: How did the idea come about for the University of Utah to start a women's hockey team? Lina: That’s quite a story, but to cut it short, I had intended to move out to Minnesota to get more involved with hockey. Right before everything was settled, after I had signed my lease there and everything, I got laid off with no other foreseeable options for income. My only choice was to go back to Utah, but I decided if I was going to go back, I would bring competitive women’s hockey with me. I drove back and got the ball rolling at the University that week. It all just fell into place from there, with massive help from a few teammates and my coaches along the way. None of this would be possible without them. Gavin: For those who may not know, explain what the no-cut policy is, and how it benefits the players. Lina: Utah is in an unfortunate position right now where it’s essentially a void for hockey–especially women’s hockey. Most of us never had the chance to play when we were younger, so it can be a little intimidating if you’re wanting to finally learn how to play as an adult. When we say, “We’re a no-cut team,” we mean we will take anyone, no matter their skill level, and teach them to play. Our only requirement is that you’re at least 18 years old. Though we’re on the way to creating a team that competes at a collegiate level, we will always maintain our recreational no-cut team as a separate entity. Gavin: What was it like originally building up the coaching staff and creating a balanced structure on that end? Jackie: I met the now manager of the team, Lina, a couple of years ago and coached her on how to play in goal. Last fall, after a Salt Lake Black Diamonds practice, we got speaking about the women's team at the U and it's potential. I jumped on board right away. Lina: I was incredibly fortunate to have them approach me! I’d known Jacs and Zeph for a bit before all this. As soon as I told them about this whole thing, they were on board immediately. I’m insanely grateful for that. As for Tanner Kearney, Kody Rodriguez, and Shane Storer, Zeph brought them in for help and we’ve had them ever since. Dalton Spice came in helped lay the foundations for skating with the new girls. I consider them all family at this point, they’ve all helped in such massive ways. Maintaining balance can be fun at times, but Jacs and Zeph always end up agreeing on what they’re wanting to do with the team in the end. Gavin: What's the process like for finding players and helping them figure out what positions they're best at? Lina: Typically, prospective players will approach us or get brought in by friends who are already on the team. We don’t really do much advertising, it’s pretty much entirely word of mouth. Once they hit the ice with us, we let them experiment with positioning until they find something they’re comfortable with. For the college team, however, there will be this whole process of recruiting. Players will email us or we’ll email players who we like the looks of based on highlight videos and their academia. We’ll be setting up try-outs soon for the college team, actually. Lots of kids from all over the country and Canada will be coming in to check out the U, the state, and what we have to offer. We judge them just as hard as they judge us. At that point, of course, they’ve been playing their whole lives so they already know which position they want to be in. Jackie: The advantage to having a good sized coaching staff is the ability to take time with players on an individual basis. We can monitor their progress, hone their talents and place them where their talent can be best utilized. Gavin: When the team officially started up, what was it like for everyone involved competing throughout the season? And what was the biggest lesson you took away from your first year? Jackie: I am amazed by what can be accomplished by perseverance and determination. We had a few players at the beginning of the season who didn't have much in the way of experience and the progress they have made in such a short time is amazing. These players always get right back up when they fall and they are always pushing themselves. I am so proud of how far they have come. Lina: It’s been difficult for me because I have to switch between manager mode and player mode. If we lose a game, it not only affects me as a goaltender, but also as a manager, so it’s almost like a double loss. It’s definitely been challenging learning to separate the two in my head, but I think I also have the added advantage of getting to know my girls on a more personal level than if I were just standing on the bench. Aside from that, the biggest lesson I’ve learned so far have been that I can’t control everything and sometimes it’s best to step back and go with the flow. Gavin: How has the current season been treating both yourselves and the players? Lina: I think everyone is enjoying it. I really think we have fun. I feel like we’ve formed this little family, and regardless of winning or losing, they’re always stoked to be here and happy to help each other out. It shows on and off the ice–everyone respects the hell out of each other and looks forward to the next time we can all play together. That’s the spirit of hockey, I think. Jackie: The first season a team has together is always filled with trial and error. We have been working hard on finding what positions work best for the individual players and building consistent lines that flow well. The players have come together really well as a team in such a short time, it is very gratifying to see. Gavin: Right now you're a part of the Utah Amateur Hockey Association. How has it been working with the league and playing against the teams associated with it? Lina: The UAHA has been phenomenal and so has every team involved with it. Everyone at the UAHA has done everything they can to get us situated, and the rest of the teams seem to be excited that we’re here. We’ve had a lot of support from all over the state. Gavin: You mentioned to me earlier that next year you'll be joining the American Collegiate Hockey Association. Why the change and what do you expect to happen in the new league? Lina: Well, the recreational team will always be here. I made a promise that I’d wouldn’t leave them behind, and I’ll stick to that. However, my mission in the first place was to create a women’s team that would compete on a collegiate level. I don’t have any expectations with the ACHA or the new team. I don’t want to have any–I just want to play it by ear. We’ll definitely get to that level, it’s bound to happen, especially with how many people we have backing us. I just don’t want to make any promises to myself or anyone else until we’re established, especially on time frame. That said, I firmly believe Utah is ready for a competitive women’s team. 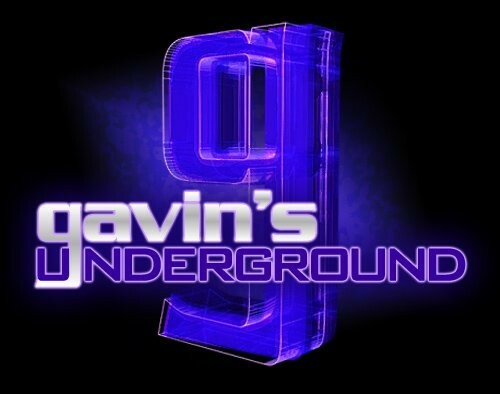 Gavin: As of this interview (when this runs) you'll have 12 games left in the season. What are you most looking forward to in the second half of the year? Jackie: I want to continue what we have been working on, which is to solidify consistent lines; as in three forward players or two defensive players whom always play together. This creates a familiarity for players of their line partners. Hockey is such a fast paced game that it is helpful to have line groups that are familiar enough with each other's movements that they can predict what their line-mates will do (e.g. : a defenseman who knows if they pinch their line-mate will cover them, or a forward who knows if a line-mate of theirs is prone to drop passes). I would also love to see word of our team get out more. I want girls around the state to know that there is now an option for them to play college hockey in Utah. Lina: I’m looking forward to getting to know my team and coaches better, and to start making plans for next season. We have loads of ideas that we’re looking to implement, and we’ve already made a lot of ground. 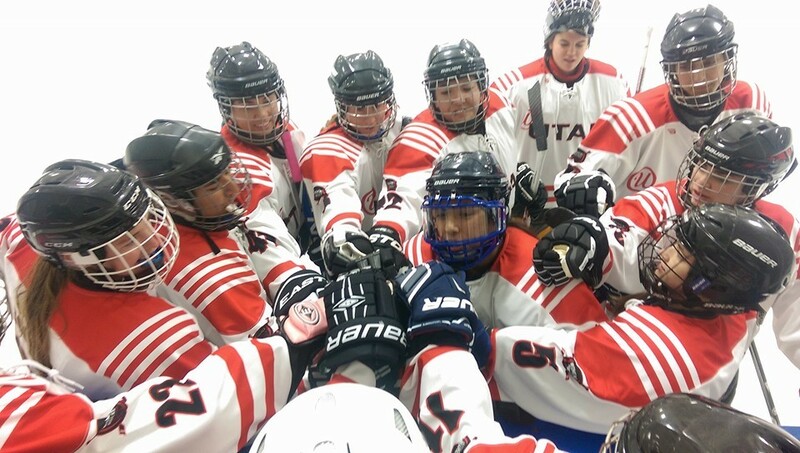 We’re the first women’s hockey team of any sort to be established at a university in Utah, and we’ll be the first competitive women’s hockey team at a university in the state of Utah. We have support from the U, and most importantly, from our community–it’s all uphill from here. Gavin: For those looking to join the team, how can they get involved? Lina: Just reach out! We don’t bite. Email us at wih.utah@gmail.com, and we’ll get back to you with everything you need to know. We would love to have anyone who is interested. Our New Year’s resolution is to turn women from hockey fans into hockey players. Gavin: As far as the rest of the season goes, how can people get tickets and where can they see you play? Lina: Our recreational team’s games are free and always will be! We love a crowd and we get pumped with every fan we have come to see us play. We play at the Salt Lake City Sports Complex on Friday and Saturday nights. You can see our schedule at Facebook. Gavin: What can we expect from all of you and the team over 2016? 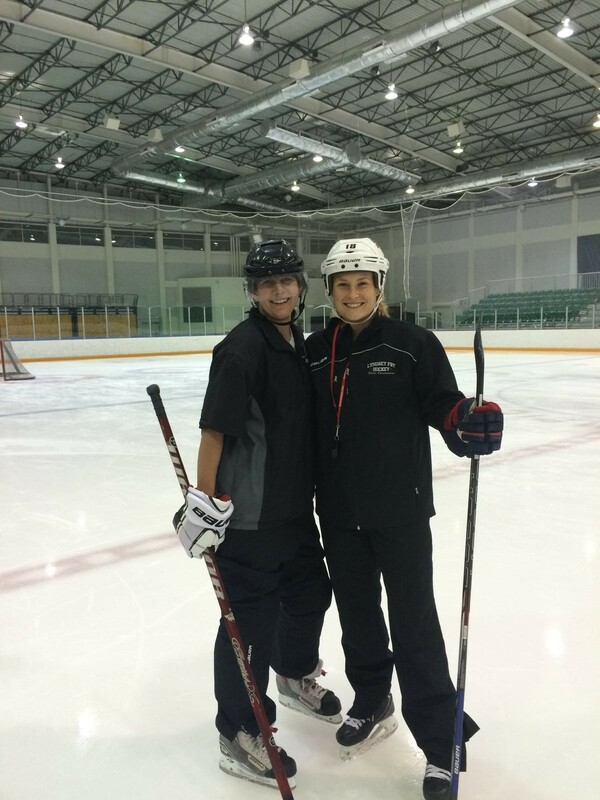 Jackie: My biggest ambition for this year as a whole is to help grow women's hockey in Utah. Lina: A lot of growth. 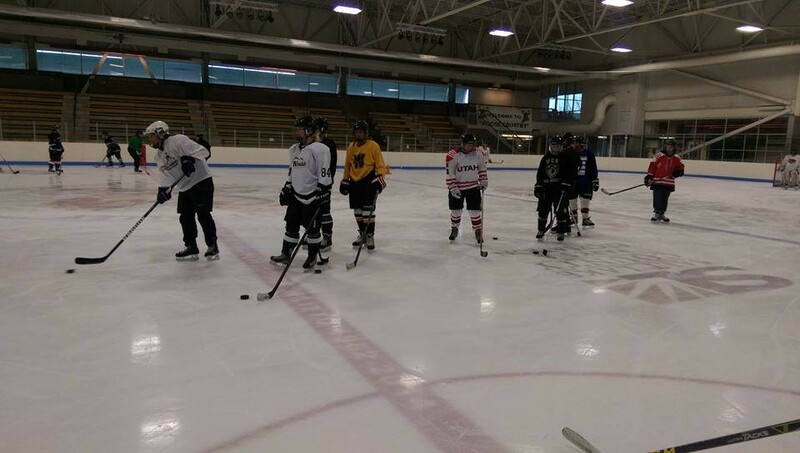 We’re breaking the ice, so to speak, for women’s hockey in Utah. My dream is to make an impact on the history of women’s hockey, and I believe we can do so with both teams.